What do you do when a long-term plan has completely derailed? Join us for an evening of discussion with the mother and daughter behind Grounded Goodwife, and their harrowing (and hilarious) tale of bouncing back from a dream that wasn't meant to be. 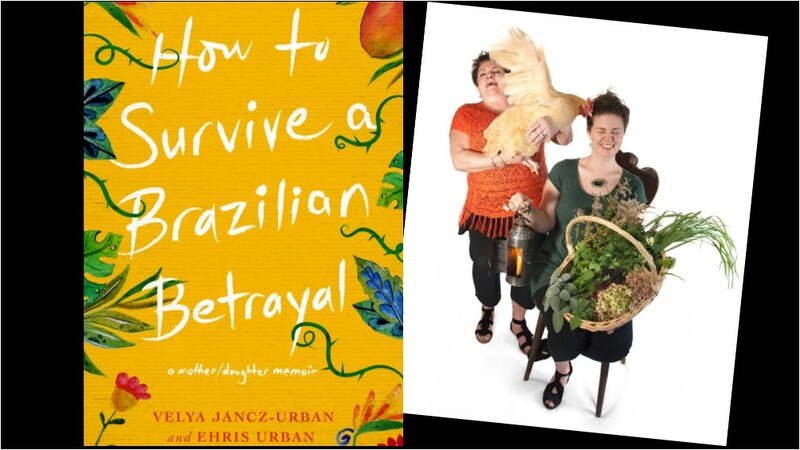 ABOUT THE BOOK: Lightening darkness with humor, Velya Jancz-Urban and her 25-year-old daughter, Ehris, introduce readers to their offbeat Connecticut family. Motivated by an 11-year friendship with a charming Brazilian named Jose Geraldo, they spend four years preparing for their move to rural Brazil, where they will run a dairy farm and open an English school. When they follow their hearts to Ponte Nova, an explosion of betrayal leaves them dazed and grieving. Broke and broken, they are forced to return to the United States, and navigate their rebirth in a foreclosed 1770 New England farmhouse. An already strong mother/daughter relationship becomes indestructible when no one else is emotionally available for them. Velya Jancz-Urban lives her life by the adage, “There is no growth without change.” She is a teacher, public speaker, former Brazilian dairy farm owner, and expert on New England’s colonial women. In 2011, Velya and her family bought a foreclosed farmhouse in Woodbury, Connecticut, unaware of what the house would reveal. Behind the walls, surprises and secrets waited to be exposed. Moving into this 1770 farmhouse ignited Velya’s interest in the colonial era. She became obsessed with colonial women and created an entertainingly-informative presentation, The Not-So-Good Life of the Colonial Goodwife. Velya teaches a variety of historical/herbal workshops with her daughter, Ehris. Velya owns How Cool Is That?! (Hands-On Science & History), and believes that hands-on learning is for everyone. She has been married for 35 years and is the mother of two grown children. She has a few too many rescue dogs and cats, is happiest with a fresh stack of library books, loves thrift shops, and is passionate about alternative medicine. Ehris Urban, owner of Grounded Holistic Wellness, believes, “If you’re grounded, you can navigate even the bumpiest roads in peace.” She grew up in a family passionate about holistic medicine. Ehris is a master herbalist and holistic nutritionist, and graduate of the New England School of Homeopathy. Additionally, Ehris is a Flower Essence Therapy practitioner. She became interested in Reiki as a teenager and attained Reiki Master certification at age 17. Ehris is also an Ingham Method reflexologist. She holds a B.A. in Anthropology/Sociology and is a certified ESL teacher. Ehris enjoys beekeeping, tending her organic vegetable and herb gardens, and working in her apothecary.